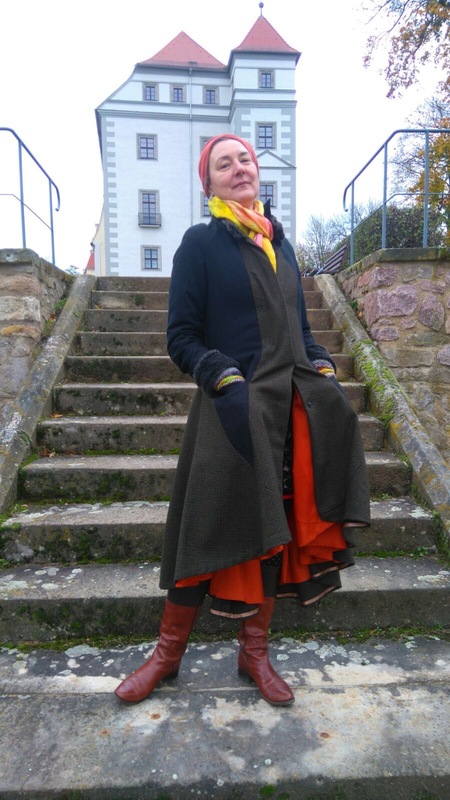 I am a textile artist and my most recent work is based on, and originates in, my training as a ladies’ tailor in 1980s East Germany. Fascinated by the elements of this trade and their application throughout history, I now in effect ‘arrange new work around the traditional skills’ – linking old to new. Practical considerations rooted in the past, a fastener, a collar or a pocket are extended to embody an idea, a concept or a metaphor. These old techniques may structure the next leap in my development, and always refer back to the fundamental skills that I learnt, driving a parallel development from the traditional to the contemporary. My formative education was in East Berlin in the 1980s where, after basic schooling, the acquisition of a skill or ‘trade’ provided the necessary building blocks for the future. As such, these skills were vitally important. They gave me the means to realise my chosen training as a ladies’ tailor, but I was already thinking beyond this simple application, searching for ways to expand my repertoire and broaden my horizons in line with the huge political upheavals going on all around me. In the early 1990s I arrived in Scotland determined both to support myself through this trade, and to look at the possibilities which were appearing around and beyond it. After completing a Masters in Performance Costume at Edinburgh College of Art I travelled extensively, working with various ballet, opera and theatre companies around the world. My early experiences had given me a unique, quiet confidence and determination, as well as providing me with the tools to immerse myself in these new opportunities. On returning to Scotland I focused both on personal and collaborative projects, as well as on a range of education and community ventures, involving myself fully in aspects of the life and culture of my adopted home. Each strand of my work fed and informed the other; the social histories of the miners in Prestonpans, the folklore of the fisher folk and the knitters on Shetland inspired my own intimate installation work and large scale textile sculptures. Looking both to history and to old indigenous skills, I tried to reawaken interest in both the young and old of the communities I worked with, helping to bring largely forgotten ‘crafts’ back into contemporary lives. In 2007 I took up a one year Residency, ‘A Plum Job’ here in the small Fife town of Newburgh. Once again I worked with all aspects of the community, and the year culminated in an exhibition, ‘Brown Linen’ at St Andrews Museum. Having decided to settle in Newburgh, I re-focused on tailoring, costume and millinery skills, and opened a small dedicated studio with business partner Alison Mountain which soon outgrew the town and moved to nearby Perth. From this studio I continue to research, revive and rework old skills which I use and adapt in my contemporary practice as well as passing on to others through workshops and mentoring schemes. Big Cat Textiles is where I teach Masterclasses in Creative Pattern Cutting and Sewing and together with Alison, invite internationally renowned textile artists from around the world to come and teach in a range of quality craft and art disciplines. This unique centre offers access to high quality tuition for all, as well as attracting visitors from around the world to Scotland.